Physical or digital. Old school or newfangled. Comic book readers today have a choice between purchasing books at their local comic store or buying them digitally. 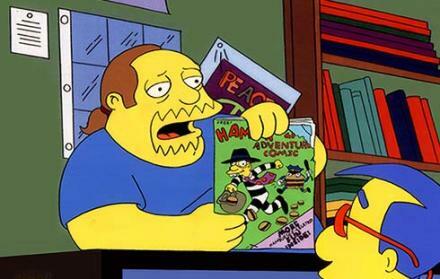 Personally, I still prefer going to my comic shop, Pulp Fiction, every Wednesday to get my new comics. The anticipation of having someone behind the store counter handing me books from my pull list every week is a thrill I still enjoy after all these years. For me, physical is preferable to digital and, I believe, always will be. I’m an old-fashioned kind of guy. I’ve read many books digitally on other people’s ipads and on computers. I admit, the resolution of the art is beautiful and crisp. Fans of digital will say the convenience of buying a comic book with the touch of a finger is a big turn-on. You don’t have to leave the comfort of your home. People also extol the ease of organizing one’s books on their Comixology account and can easily find a book they are looking for instead of searching through boxes for a specific issue. Also, they find it easier to lay back with an e-reader and relax when they read a book. Although the digital people have some valid arguments, I prefer the physical for many reasons. I find physical comic books comforting, just as I find other physical books comforting as well. Nothing can replace the feeling of holding a comic book in your hand. The tactile nature of reading a book is something I’ve enjoyed all my life and it will always excite me. When I read a comic book digitally, I read it much quicker for some reason. Maybe it’s because I feel the book is not permanent and can easily be taken away or lost in the ether. That sense of enjoyment and comfort in the immersion of the book would be lost if I switched to digital. I’ll enjoy the book, but I won’t feel a sense of excitement. The sense of permanency I feel with physical comics has much to do with the feeling of history that comes with having a physical collection. When going through my long or short boxes, I can take out a book and remember where I was in my life at the time of its publication. Memories flood through me. I can specifically remember sitting on the couch at home reading an issue of Batman with the Joker on the cover on the first day of the Gulf War in 1990. I can conjure in my memory a specific day as a teenager reading an issue of Batman with the villain Killer Croc battling the caped crusader. The empathy I felt for Killer Croc can still be felt and that specific day filled with teenage angst can be recalled with one look at the first aging page. Digital sympathizers may say ease of finding an issue is best served with digital, but I can easily find an issue I’m looking for in my boxes. My OCD level of organization aids me in keeping my collection neat and orderly. I have a system that aids me well when I need to find a particularly amazing book. Taking care of my books by bagging and boarding and then having them in their box is not only an organizational tool, but a protective one as well. By protecting them, I can enjoy them for years to come. They paper may age, unlike digital, but my enjoyment of the books remains the same as when I first bought them. A sense of community is much greater when someone buys books physically rather than digitally. The comic book shop is a place where you can talk to other comic book lovers every week. Emphasis is placed on the books everyone loves and that sense of sharing our thoughts on books we love with another person and also discovering new books is an exhilarating feeling. I’ve gotten recommendations some weeks from the shop workers to try a new first issue of a book and ended up loving a book I would never have tried or thought would be to my taste. If someone just stuck to getting their information from others on internet message boards or comment sections on comic book websites, then they would see a preponderance of negativity over intelligent conversation. Interaction with others is vital in nurturing our passion for comic books. I’m not advocating the end of digital or chastising those who prefer digital over physical comic books. It shouldn’t be a fight. As long as people are discovering comic books for the first time and readers new and old are buying them, the format they come in does not matter one bit. Digital is bringing in more people, which is great for the industry and great for the creators. The love of the physical is just vastly preferable to me and I believe physical will always be around for people like me. Other kinds of books haven’t been phased out, so I have hope. I’m remaining proudly in my physical world.